The US Air Force Academy Southeast Asia and Vietnam Memorial Pavilion is the first of five major pavilions planned along the Heritage Trial, a meandering hilltop path overlooking the historic Cadet Area. The project design challenge was to balance the purity of the modernist-historic architecture with the semi-remote site, steep terrain, and surrounding natural features. Every aesthetic choice and finish material in the pavilion is imbued with symbolism. The concrete plaza follows the formal grid paving of the Academy's historic Cadet Area. 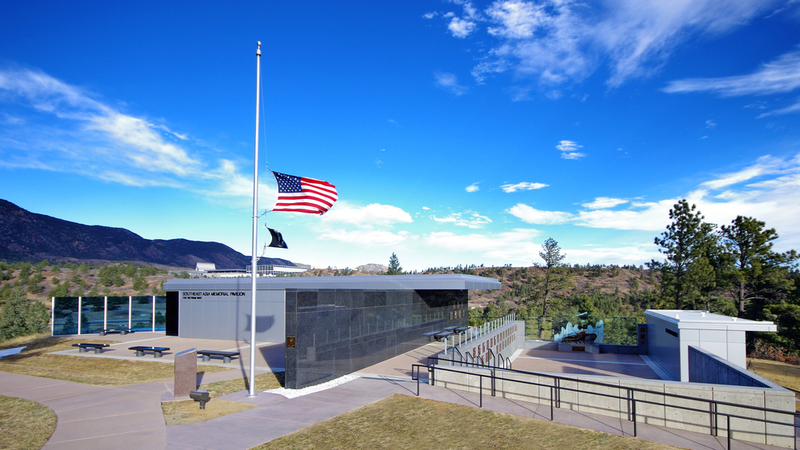 The roof of the enclosed building cantilevers over the outer corner facing the northwest to present unblemished views of the Cadet Area against the backdrop of the mountain range beyond. 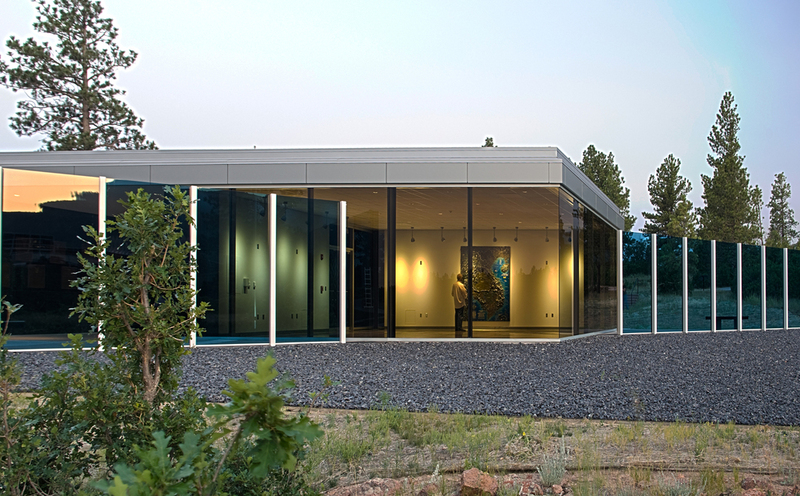 The glass and metal building is pierced by a blue-tinted glass wall forming a diagonal across the orthogonal grid that represents the “Long Blue Line” of USAFA Cadets standing in service to their nation. The eastern edge of the plaza is bounded by a ten foot tall black granite wall in reference to the national Vietnam War Memorial. 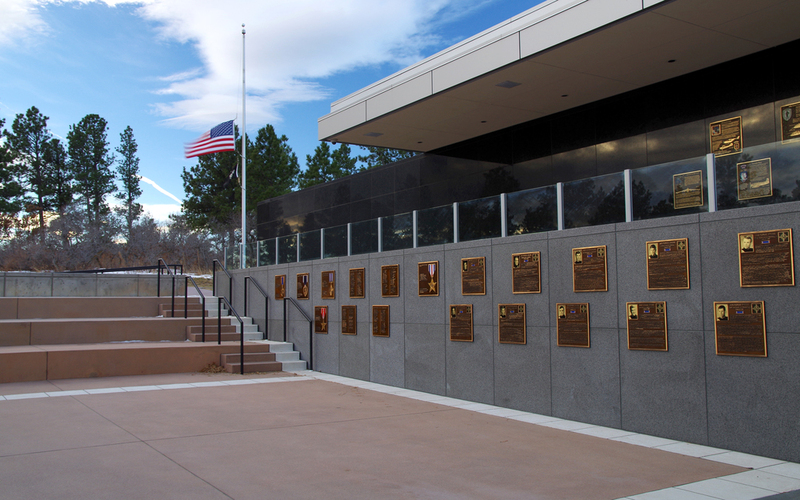 Fourteen bronze plaques, one for each of the classes from 1959 to 1972 with members killed in combat, are mounted on the granite wall. The project was sponsored and funded by the Class of 1970 and includes nine granite benches placed throughout the plaza, each dedicated to one of the nine Class of 1970 graduates who lost their lives during the Southeast Asia conflicts. An eight foot high monumental bronze relief map of the Southeast Asia theatre, commissioned specifically for the interior of the memorial, highlights battles, air force bases, and significant events of the war. It’s Ho Chi Minh Trail is the most accurate topographical depiction of the trail in existence. The single room pavilion is only open during daylight hours or for special events and is designed to consume minimal energy. All lights are on motion sensors, interior lighting utilizes timer switches, and radiant panels in the ceiling provide minimal space heating. Natural cooling is accomplished through existing shade trees and direct ventilation. These attributes resulted in significant waste reduction, energy efficiency, and sustainability of the building. The Plaza of Heroes is a privately funded addition to the Southeast Asia Memorial Pavilion at the United States Air Force Academy in Colorado Springs. Both of these projects were designed by HB&A under the design-build general contractor. Jointly planned by the USAFA Classes of ’65 and ’70, the Plaza honors Academy graduates who received commendations for their service during the armed conflicts in Southeast Asia. The Plaza is nestled atop a bluff overlooking the Cadet Area and mountains to the west, surrounded by Gambel oak thickets and pine trees in a beautiful natural setting. The concrete surface steps gently down the hillside in three terraced platforms, creating an amphitheater suitable for class gatherings and memorial services. The material palette is reserved and dignified, consisting of salmon colored concrete with white accent bands, gray granite walls, clear anodized aluminum wall panels, and clear glass railings. The focal point of the Plaza is a larger-than-life bronze sculpture of the Academy's only Medal of Honor recipient, Captain Lance Sijan '65, placed in front of a backdrop of clear and etched glass panels. Inscribed in gold leaf on the glass panels are the “American Fighting Man’s Code of Conduct” and the “Medal of Honor Citation” for Capt. Sijan. To one side of the Plaza is a gray granite wall on which are mounted bronze plaques honoring the 16 Air Force Cross recipients and 205 Silver Star recipients from the Air Force Academy. The other side is bounded by a metal-clad building with restrooms and storage for events at the Plaza. The Southeast Asia Memorial Pavilion with its polished black granite memorial wall and cantilevered roof is perched above the sunken Plaza, offering a reminder of the sacrifices given by so many Academy graduates in service to their nation.